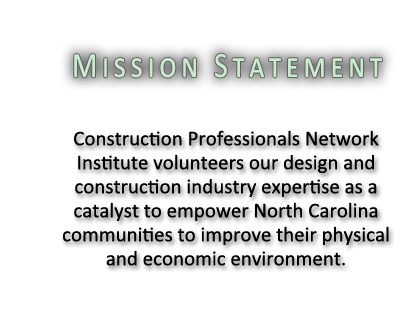 Construction Professionals Network Institute, Inc. is a non-profit initiative focusing on construction industry related projects and community service throughout the State of North Carolina. CPN of North Carolina, Inc., a non-profit construction industry membership organization, founded CPN Institute in 2006 to expand its mission of service to the construction industry and provide assistance to communities throughout North Carolina. The CPN Institute was incorporated as a non-profit 501 (c) (3) corporation in 2011 to focus on education and community services.